Subway ridership is exploding with 1.751 billion straphangers riding the rails in 2014, a 2.6 percent increase from the year before, according to the Metropolitan Transit Authority. MIDTOWN — Subway ridership is exploding with 1.75 billion straphangers riding the rails in 2014, a 2.6 percent increase from the year before, according to figures released by the Metropolitan Transportation Authority. The highest level of growth was in Brooklyn, specifically along the L line, where every station saw an increase in ridership and in Long Island City where the Vernon-Jackson stop on the 7 train saw a 12 percent bump. Last year, an average of 5.6 million riders used the train on the weekdays, an increase of 132,000 riders from a year ago and a 500,000 person increase from five years ago. The ridership numbers are the highest in 65 years. On the weekends, when the MTA normally does track work, an average of 6 million people are riding the subway. The increased ridership combined with mechanical failures of old tracks and signals has led to increased delays with more than 20 percent of all trains arriving late. MTA Chairman and CEO Thomas Prendergast said the "decrepit system of the 1970s and 1980s" has been resurrected. But the increased ridership "means even minor disruptions now can create major delays." The agency is working to "combat delays and improve maintenance" but the "ultimate solution requires investing in infrastructure upgrades," said Prendergast. The growth in ridership stretches across all five boroughs and among all lines. But certain parts of Brooklyn and Long Island City in Queens are seeing explosive growth. Brooklyn gained 31,000 more riders borough-wide on weekdays, an increase of 2.7 percent. Manhattan saw the number of riders increase by 2.5 percent followed by 2.1 percent in The Bronx and a 1.9 percent increase in Queens. Every stop on the L train saw increased ridership last year with growth of 4.7 percent or 5,600 additional riders on an average weekday. The Bedford Avenue station in Williamsburg had 27,224 average weekday customers, more than any station on the line. Three L train stations saw growth between 9.3 and 11.5 percent, Bushwick Avenue-Aberdeen Street, Wilson Avenue and Jefferson Street. MTA officials said that because the L train is the only line with Communications-Based Train Control — which allows more trains to run closer together — which helped them handle the increased ridership. But 18 percent of L trains were late arriving at their station last year, approximately the same amount as the year before. The percentage of L trains with medium and major delays jumped to 8.5 percent in 2014 from 6.2 percent the year before, a 25 percent increase. The M train which serves the same locale as the L also saw growth with ridership up 6.2 percent at stations between Marcy Avenue and Metropolitan Avenue. Residential development is driving the ridership growth in Queens, say MTA officials. Average weekday ridership at the Vernon-Jackson Avenue 7 station increased 12 percent or 1,500 riders. The Court Square stop saw an increase of 9.7 percent or 2,000 customers. Communications-Based Train Control is being installed on the 7 line to increase capacity. In the Bronx, the 2 and 5 lines gained 4,800 additional passengers, an increase of 3.7 percent. The 2 and 3 Lenox Avenue lines in Harlem saw growth of 2,100 customers or 3.7 percent. Even with a recent increase in fares to $2.75 from $2.50, the MTA still lacks the funding to do things such as install Communications-Based Train Control on more of its lines. The MTA is currently $15 billion short in its $32 billion five year capital plan. It's unclear if the gap will be closed or whether the agency will have to slice its priorities. John Raskin, executive director of the Riders Alliance, says the MTA must be fully funded to make repairs and upgrades if it is going to keep pace with increasing ridership. 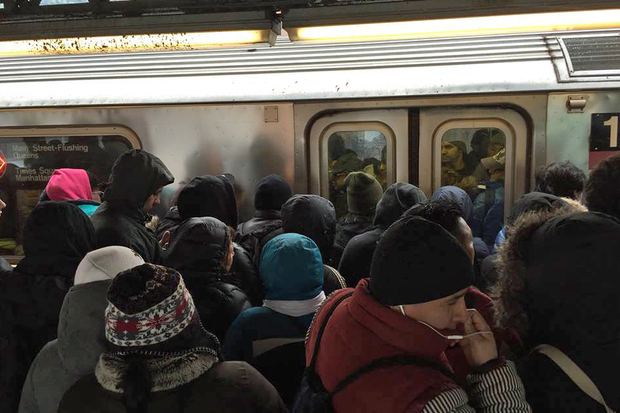 "More people are riding public transportation but funding has not grown to match," said Raskin whose group recently collected "subway horror stories" from riders about heavy delays and being stuck on trains in an effort to encourage the state to increase funding.